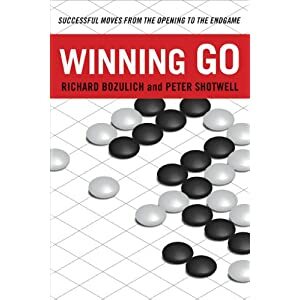 Winning Go by Richard Bozulich and Peter Shotwell is a problem book with 203 problems, which cover every stage of the game. Not only life and death, but also tesuji, joseki, opening, middle, endgame and counting problems. The commented answers demonstrate also the wrong moves. From Daal (Daniel Goldman) First appeared in Lifein19x19 Book Discussions. Although I wasn't among those selected to do a review in exchange for a free copy, Peter's description of the book was enough to make me want to buy it anyway, so after a preliminary perusal, here is my unbiased review. The first thing that one notices about the book is that it is thick. It is an oversized paperback, 9x6 inches and has 256 pages. A first flip-through shows lot and lots of diagrams, some of them a tick small. The book is divided into seven chapters entitled: Katachi - Making Good Shape, Fuseki - The Opening, Tesuji. Clever Moves, Shikatsu - Life and Death, Joseki Local Skirmishes, Chuban- The Middle Game and Yose - The Endgame, and as such offers the reader study material for literally all phases of the game. With one exception, each chapter consists of a brief introductory text, a set of problems and a detailed answer section. The exception is the first chapter on shape, which does not include a problem section. This is because the authors view shape not as a separate subject, but rather as an essential consideration in all phases of the game. Like the other introductory texts, this chapter offers a clearly presented but superficial treatment of the subject, mentioning, defining and illustrating a few elementary concepts. The goal of the book however is to deepen the reader's understanding of these elementary concepts, and that takes place in the problem section. I have done the first two problems in each section, and as a 6k I can say that they are challenging. The first chapter with problems covers the opening and the reader is presented with 40 full board problems. Both of the problems I did served to illustrate a concept in the introductory text, and thanks to having having these concepts fresh in my mind I answered both correctly. The answer to the first problem begins by showing the initial position. I like this, and it is a general principle that is followed throughout the book. It is followed by diagrams illustrating the consequences of a faulty move, and the correct solution. The text of the answer explains which principle the correct answer follows. I like this too. The third chapter includes 27 tesuji problems. The problems do not appear to be organized in any particular way and encompass a wide range of tactical challenges, such capturing or saving stones, linking up,making shape etc. I got one problem wrong and one right. In the illustration of the answer to problem 2 was a mistake in the diagram. One of two that I discovered in the twelve problems I did. Clearly the book will benefit from some editing before a further edition is printed. The fourth chapter offers 36 L&D problems and begins with a brief overview of killing techniques. As with the previous chapter, the problems appear unsorted. The answer section is however fairly thorough, including sometimes diagrams of several continuations as well as failures. Again, I got one problem wrong and one right. On a side note, while glancing at the problems, I immediately recognized number 5, which is practically identical to the problem on page 119 of Lessons in the Fundamentals of Go, where Kageyama nastily says : A dan-ranked player should have the answer the moment he sees the diagram. Anyone who cannot solve it at all has a doubtful future. While the authors refrain from such judgment, their answer, including the description of the failure, is virtually identical to Kageyama's. The chapter on Joseki takes a new twist on the subject, and is my favorite in the book. In it, we are presented with 45 initial positions, and asked to find the continuation. It is suggested to lay the problems out on the board before trying to work them out. I have not seen this approach before, and it has several advantages. First, it makes you think about how the position came to be in the first place. This makes you consider the purpose of those moves. Then, when looking for the continuation, it becomes apparent that the inital logic must be continued. 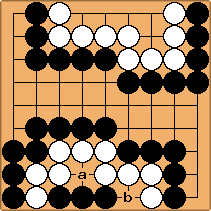 The first two problems were a variation of basic joseki in which white makes a low approach to a hoshi stone and after black extends and white moves into the corner, black pincers instead of defending the corner. I was not familiar with this variation, and doing the problems gave me an excellent opportunity to follow the standard advice of trying to understand instead of just memorize the joseki moves. I got both of the problems partially right, and found the answer section, which encompasses almost 50 pages, to be informative. Chapter six offers 24 whole-board middle game problems. I got the first one right, and the second one completely wrong. Again, the authors don't skimp on the answer section, and include diagrams and explanations of both failures and correct answers. 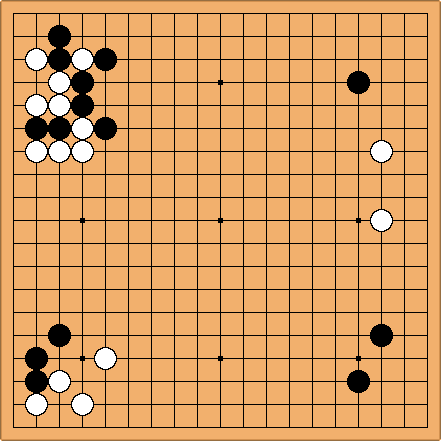 The last chapter, Yose -- The Endgame begins with a concise description of the the interaction of gote and sente and the basic (simplified) principles of endgame counting. The 31 problems are organized to first practice counting the values of endgame moves, then to look for the most valuable moves and lastly to look for endgame tesujis. I appreciated the simple approach to counting, and although I got both problems wrong, I was at least close. Compared to the other problem books that I own, Winning Go is less thorough in presenting concepts than the books in the Elementary Go series by Davies et al., and has fewer but more difficult problems than in Bozulich's own Get Strong at Tesuji or 1001 L&D problems. What is exceptional is it's wide range of topics and it's detailed and instructive answer sections. Although I have only done a smattering of the problems, my impression is that they are more difficult than the introductory texts would indicate, and not inappropriate for a player around my level or perhaps stronger. For me, the book offers valuable study material to help combat a broad range of deficits, and I would certainly recommend it to those who like to use problems to deepen their understanding of a wide range of topics, and don't scoff at reading the answers. Peter Shotwell: Writing a go book with Tuttle is not like doing it with a go-dedicated press--for example, one doesn't see the final product with diagrams and text together until it is printed. Also, the schedule was rushed. In any case, kind readers pointed out some flaws. There were a few inconsequential transcriptions, however the following were not. All will be corrected in the next edition! Thanks in particular to Ed Lee and Daniel Goldman. Page 52 Correct Answer should have White 6 in the second diagram. Page 53 Problem 5 Correct Answer should read "... Black threatens to atari with 3 ..." instead of "...Black ataries with 3 ..."
Page 111 Problem 3 diagram should have the white stone shown in the last two answer diagrams. I assume that the "three marked" moves are the three black stones on the bottom as they are not really "marked". But if Black plays at "a" isn't the white group truly dead?